Концепции файловой системы полезны для прикладного программиста , потому что они используются им при написании приложений. Слово файл имеет реальный аналог. Ранее файл представлял из себя набор одного или нескольких стандартных листов бумаги. В линуксе файл - это линейный набор бвйт. Этот набор играет большую роль в жизни пользователя. Файловая система реализует интерфейс хранения этих данных и манипуляции ими на внешних носителях. В линуксовом файле есть много атрибутов и характеристик. Атрибутами являются имя файла , его расширение. Файлы с расширениями .h или .c используются компиляторами и линкерами как хидеры и исходники. Линукс поддерживает множество файловых типов , таких как регулярные файлы , директории , линки , файлы устройств ,сокеты,пайпы. Регулярные файлы включают в себя бинарные и ASCII файлы. ASCII представляют из себя обычный набор текста. Некоторые ASCII файлы выполняемы и называются скриптами , выполняемыми с помощью интепретаторов. Важнейшим интерпретатором является шелл. Бинарные исполняемые файлы интерпретируются уже ядром и выполняются ядром. Их формат известен как object file format. Каталоги в линуксе организованы в иерархическую систему которая показана на рисунке Figure 6.1. Линк является указателем и указывает на другой файл. Файлы устройств представляют I/O устройства. Для доступа к таким устройствам программы используют такие файлы. Существуют 2 типа устройств: блочные устройства, которые переводят данные в блоки, и символьные устройства, которые переводят данные в символы. Сокеты и пайпы являются формой Interprocess Communication (IPC). Такие файлы поддерживают непосредственный обмен данными между процессами. Для каждого файл ведет себя по-разному. Права используются применительно к 3 операциям : чтение , запись и выполнение файла. В соответствии с классификацией мы имеем девять наборов прав. Другие атрибуты включают размер , время создания и изменения и могут быть распечатаны с помощью утилиты ls. Например , некоторые файлы ядра имеют атрибуты , которые невидимы пользователю. A directory is a file that maintains the hierarchical structure of the filesystem. The directory keeps track of the files it contains, any directories beneath it, and information about itself. In Linux, each user gets his own "home directory," under which he stores his files and creates his own directory tree structure. In Figure 6.1, we see how the directory contributes to the tree structure of the filesystem. With the arrangement of the filesystem into a tree structure, the filename alone is not sufficient to locate the file; we must know where it is located in the tree to find it. A file's pathname describes the location of the file. 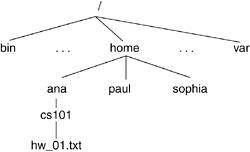 A file's location can be described with respect to the root of the tree, which is known as the absolute pathname. The absolute pathname starts with the root directory, which is referred to as /. A directory node's name is the directory name followed by a /, such as bin/. Thus, a file's absolute pathname is expressed as a collection of all the directory nodes one traverses in the tree until one reaches the file. In Figure 6.1, the absolute pathname of the file called hw1.txt is /home/ana/cs101/hw1.txt. Another way of representing a file is with a relative pathname. This depends on the working directory of the process associated with the file. The working directory, or current directory, is a directory associated with the execution of a process. Hence, if /home/ana/ is the working directory for our process, we can refer to the file as cs101/hw1.txt. In Linux, directories contain files that perform varying tasks during the operation of the operating system. For example, shareable files are stored under /usr and /opt whereas unshareable files are stored under /etc/ and /boot. In the same manner, non-static files, those whose contents are changed by system programs, are stored under the vcertain directories under /var. Refer to http://www.pathname.com/fhs for more information on the filesystem hierarchy standard. In Linux, each directory has two entries associated with it: . (pronounced "dot") and .. (pronounced "dot dot"). The . entry denotes the current directory and .. denotes the parent directory. For the root directory, . and .. denote the current directory. (In other words, the root directory is its own parent.) This notation plays into relative pathnames in the following manner. In our previous example, the working directory was /home/ana and the relative pathname of our file was csw101/hw1.txt. The relative pathname of a hw1.txt file in paul's directory from within our working directory is ../paul/cs101/hw1.txt because we first have to go up a level. File operations include all operations that the system allows on the files. Generally, files can be created and destroyed, opened and closed, read and written. Additionally, files can also be renamed and its attributes can be changed. The filesystem provides system calls as interfaces to these operations, and these are in turn placed in wrapper functions that are made accessible to user space applications by way of linkable libraries. We explore some of these operations as we traverse through the implementation of the Linux filesystem. A file descriptor is an int datatype that the system uses to identify an open file. The open() system call returns a file descriptor that can later be used on all future operations to be visited upon that file by that process. In a later section, we see what the file descriptor stands for in kernel terms. Each process holds an array of file descriptors. When we discuss the kernel structures that support the filesystem, we see how this information is maintained in an array. It is by convention that the first element of the array (file descriptor 0) is associated with the process' standard input, the second (file descriptor 1) with standard output, and the third (file descriptor 2) with standard error. This allows applications to open a file on standard input, output, or error. Figure 6.2 illustrates the file descriptor array pertaining to a process. File descriptors are assigned on a "lowest available index" basis. Thus, if a process is to open multiple files, the assigned file descriptors will be incrementally higher unless a previously opened file is closed before the new one. We see how the open and close system calls manipulate file descriptors to ensure this. Hence, within a process' lifetime, it might open two different files that will have the same file descriptor if one is closed before the other is opened. Conversely and separately, two different file descriptors can point to the same file. To understand the concerns of filesystem implementation, we need to understand some basic concepts about hard disks. Hard disks magnetically record data. A hard disk contains multiple rotating disks on which data is recorded. A head, which is mounted on a mechanical arm that moves over the surface of the disk, reads and writes the data by moving along the radius of the disks, much like the needle of a turntable. The disks themselves rotate much like LP's on a turntable. Each disk is broken up into concentric rings called tracks. Tracks are numbered starting from the outside to the inside of the disk. Groups of the same numbered tracks (across the disks) are called cylinders. Each track is in turn broken up into (usually) 512K byte sectors. Cylinders, tracks, and heads make up the geometry of a hard drive. A blank disk must first be formatted before the filesystem is made. Formatting creates tracks, blocks, and partitions in a disk. A partition is a logical disk and is how the operating system allocates or uses the geometry of the hard drive. The partitions provide a way of dividing a single hard disk to look as though there were multiple disks. This allows different filesystems to reside in a common disk. Each partition is split up into tracks and blocks. The creation of tracks and blocks in a disk is done by way of programs such as fdformat whereas the creation of logical partitions is done by programs such as fdisk. Both of these precede creation of the actual filesystem. fdformat is used for low-level formatting (track and sector creation) of floppies. IDE and SCSI disks are generally preformatted at the factory. The Linux file tree can provide access to more than one filesystem. This means that if you have a disk with multiple partitions, each of which has a filesystem, it is possible to view all these filesystems from one logical namespace. This is done by attaching each filesystem to the main Linux filesystem tree by using the mount command. We say that a filesystem is mounted to refer to the fact that the device filesystem is attached and accessible from the main tree. Filesystems are mounted onto directories. The directory onto which a filesystem is mounted is referred to as the mount point. In tree parlance, you would say that you are attaching a subtree to a node in the main tree. One of the main difficulties in filesystem implementation is in determining how the operating system will keep track of the sequence of bytes that make up a file. As previously mentioned, the disk partition space is split into chunks of space called blocks. The size of a block varies by implementation. The management of blocks determines the speed of file access and the level of fragmentation and therefore wasted space. For example, if we have a block size of 1,024 bytes and a file size of 1,567 bytes, the file spans two blocks. The operating system keeps track of the blocks that belong to a particular file by keeping the information in a structure called an index node (inode). We visited fragmentation in Chapter 4, "Memory Management," and saw how wasted holes in memory can be created. The same kind of fragmentation problems are seen with hard disk storage. There are various ways in which the filesystem improves system performance. One way is by maintaining internal infrastructure in the kernel that quickly accesses an inode that corresponds to a given pathname. We see how the kernel does this when we explain filesystem implementation. The page cache is another method in which the filesystem improves performance. The page cache is an in-memory collection of pages. It is designed to cache many different types of pages, originating from disk files, memory-mapped files, or any other page object the kernel can access. This caching mechanism greatly reduces disk accesses and thus improves system performance. This chapter shows how the page cache interacts with disk accesses in the course of file manipulation. The implementation of filesystems varies from system to system. For example, in Windows, the implementation of how a file relates to a disk block differs from how a file in a UNIX filesystem relates to a disk block. In fact, Microsoft has various implementations of filesystems that correspond to its various operating systems: MS-DOS for DOS and Win 3.x, VFAT for Windows 9x, and NTFS for Windows NT. UNIX operating systems also have various implementations, such as SYSV and MINIX. Linux specifically uses filesystems such as ext2, ext3, and ResierFS. One of the best attributes of Linux is the many filesystems it supports. Not only can you view files from its own filesystems (ext2, ext3, and ReiserFS), but you can also view files from filesystems pertaining to other operating systems. On a single Linux system, you are capable of accessing files from numerous different formats. Table 6.1 lists the currently supported filesystems. To a user, there is no difference between one filesystem and another; he can indiscriminately mount any of the supported filesystems to his original tree namespace. Linux supports more than on-disk filesystems. It also supports network-mounted filesystems and special filesystems that are used for things other than managing disk space. For example, procfs is a pseudo filesystem. This virtual filesystem provides information about different aspects of your system. A procfs filesystem does not take up hard disk space and files are created on the fly upon access. Another such filesystem is devfs, which provides an interface to device drivers. In Linux 2.6, devfs is obsolete by udev, although minimal support is still available. For more information on udev, go to http://www.kernel.org/pub/linux/utils/kernel/hotplug/udev-FAQ. Linux achieves this "masquerading" of the physical filesystem specifics by introducing an intermediate layer of abstraction between user space and the physical filesystem. This layer is known as the virtual filesystem (VFS). It separates the filesystem-specific structures and functions from the rest of the kernel. The VFS manages the filesystem-related system calls and translates them to the appropriate filesystem type functions. Figure 6.3 overviews the filesystem-management structure. The user application accesses the generic VFS through system calls. Each supported filesystem must have an implementation of a set of functions that perform the VFS-supported operations (for example, open, read, write, and close). The VFS keeps track of the filesystems it supports and the functions that perform each of the operations. You know from Chapter 5 that a generic block device layer exists between the filesystem and the actual device driver. This provides a layer of abstraction that allows the implementation of the filesystem-specific code to be independent of the specific device it eventually accesses. The VFS relies on data structures to hold its generic representation of a filesystem. In addition to these structures, the VFS also uses additional structures such as vfsmount, and nameidata, which hold mounting information and pathname lookup information, respectively. We see how these two structures relate to the main ones just described, although we do not independently cover them. Chapter 2, "Exploration Toolkit," describes the list_head datatype in detail. On disk-based filesystems, the superblock structure is filled with information originally maintained in a special disk sector that is loaded into the superblock structure. Because the VFS allows editing of fields in the superblock structure, the information in the superblock structure can find itself out of sync with the on-disk data. This field identifies that the superblock structure has been edited and needs to sync up with the disk. This field of type unsigned long defines the maximum file size allowed in the filesystem. The superblock structure contains general filesystem information. However, it needs to be associated with the specific filesystem information (for example, MSDOS, ext2, MINIX, and NFS). The file_system_type structure holds filesystem-specific information, one for each type of filesystem configured into the kernel. This field points to the appropriate filesystem-specific struct and is how the VFS manages the interaction from general request to specific filesystem operation. The field is a pointer of type super_operations struct. This datatype holds the table of superblock operations. The super_operations struct itself holds function pointers that are initialized with the particular filesystem's superblock operations. The next section explains super_operations in more detail. This field is a pointer to a dentry struct. The dentry struct holds the pathname of a file. This particular dentry object is the one associated with the mount directory whose superblock this belongs to. The s_dirty field (not to be confused with s_dirt) is a list_head struct that points to the first and last elements in the list of dirty inodes belonging to this filesystem. The s_files field is a list_head struct that points to the first element of a list of file structs that are both in use and assigned to the superblock. In the "file Structure" section, you see that this is one of the three lists in which a file structure can find itself. 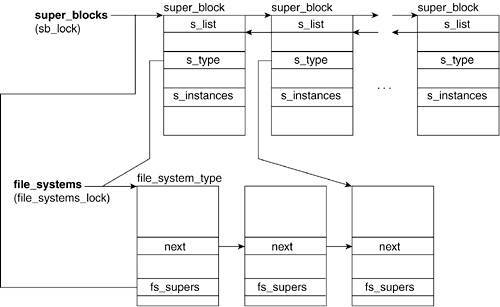 The field of s_instances is a list_head structure that points to the adjacent superblock elements in the list of superblocks with the same filesystem type. The head of this list is referenced by the fs_supers field of the file_system_type structure. This void * data type points to additional superblock information that is specific to a particular filesystem (for example, ext3_sb_info). This acts as a sort of catch-all for any superblock data on disk for that specific filesystem that was not abstracted out into the virtual filesystem superblock concept. When the superblock of a filesystem is initialized, the s_op field is set to point at the appropriate table of operations. In the " Moving from the Generic to the Specific" section later in this chapter, we show how this table of operations is implemented in the ext2 filesystem. Table 6.2 shows the list of superblock operations. Some of these functions are optional and are only filled in by a subset of the supported filesystems. Those that do not support a particular optional function set the field to NULL in the operations struct. New in 2.6. It allocates and initializes a vfs inode under the superblock. The specifics of initialization are left up to the particular filesystem. The allocation is done with a call to kmem_cache_create() or kemem_cache_alloc() (see Chapter 4) on the inode's cache. New in 2.6. It deallocates the specified inode pertaining to the superblock. The deallocation is done with a call to kmem_cache_free(). Reads the inode specified by the inode->i_ino field. The inode's fields are updated from the on-disk data. Particularly important is inode->i_op. Places an inode in the superblock's dirty inode list. The head and tail of the circular, doubly linked list is referenced by way of the superblock->s_dirty field. 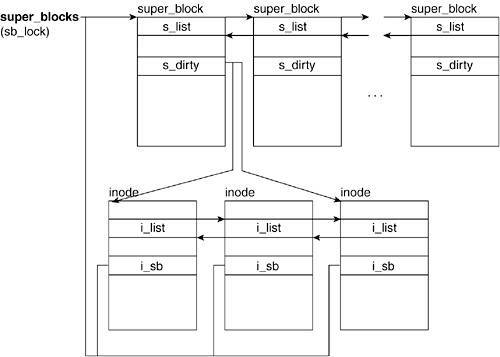 Figure 6.5 illustrates a superblock's dirty inode list. Writes the inode information to disk. Releases the inode from the inode cache. It's called by iput(). Called when the last access to an inode is dropped. Deletes an inode from disk. Used on inodes that are no longer needed. It's called from generic_delete_inode(). Frees the superblock (for example, when unmounting a filesystem). Writes the superblock information to disk. Currently used only by ext3, Resiserfs, XFS, and JFS, this function writes out dirty superblock struct data to the disk. In use by ext3, JFS, Resierfs, and XFS, this function blocks changes to the filesystem. It then updates the disk superblock. Reverses the block set by the write_super_lockfs() function. Called to get filesystem statistics. Called when the filesystem is remounted to update any mount options. Releases the inode and all pages associated with it. Called when a mount operation must be interrupted. Used to get filesystem information from a mounted filesystem. This completes our introduction of the superblock structure and its operations. Now, we explore the inode structure in detail. We mentioned that inodes are structures that keep track of file information, such as pointers, to the blocks that contain all the file data. Recall that directories, devices, and pipes (for example) are also represented as files in the kernel, so an inode can represent one of them as well. Inode objects exist for the full lifetime of the file and contain data that is maintained on disk. Inodes are kept in lists to facilitate referencing. One list is a hash table that reduces the time it takes to find a particular inode. An inode also finds itself in one of three types of doubly linked list. Table 6.3 shows the three list types. 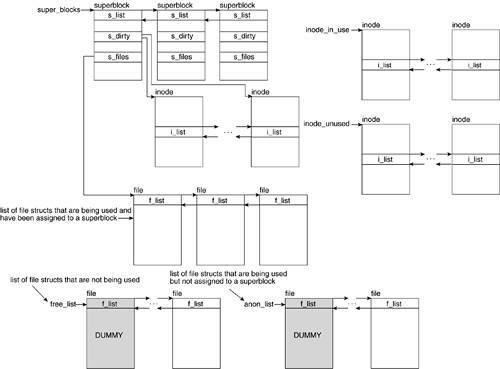 Figure 6.5 shows the relationship between a superblock structure and its list of dirty inodes. The i_hash field is of type hlist_node. This contains a pointer to the hash list, which is used for speedy inode lookup. The inode hash list is referenced by the global variable inode_hashtable. hlist_node is a type of list pointer for double-linked lists, much like list_head. The difference is that the list head (type hlist_head) contains a single pointer that points at the first element rather than two (where the second one points at the tail of the list). This reduces overhead for hash tables. This field links to the adjacent structures in the inode lists. Inodes can find themselves in one of the three linked lists. This field points to a list of dentry structs that corresponds to the file. The dentry struct contains the pathname pertaining to the file being represented by the inode. A file can have multiple dentry structs if it has multiple aliases. This field holds the unique inode number. When an inode gets allocated within a particular superblock, this number is an automatically incremented value from a previously assigned inode ID. When the superblock operation read_inode() is called, the inode indicated in this field is read from disk. The i_count field is a counter that gets incremented with every inode use. A value of 0 indicates that the inode is unused and a positive value indicates that it is in use. This field holds the pointer to the superblock of the filesystem in which the file resides. Figure 6.5 shows how all the inodes in a superblocks' dirty inode list will have their i_sb field pointing to a common superblock. This field corresponds to inode state flags. Table 6.4 lists the possible values. This macro correlates to any of the three I_DIRTY_* flags. It enables a quick check for any of those flags. The I_DIRTY* flags indicate that the contents of the inode have been written to and need to be synchronized. Set when the inode is locked and cleared when the inode is unlocked. An inode is locked when it is first created and when it is involved in I/O transfers. Gets set when an inode is being removed. This flag serves the purpose of tagging the inode as unusable as it is being deleted so no one takes a new reference to it. Indicates that the inode is no longer useful. Gets set upon inode creation. The flag gets removed the first time the new inode is unlocked. An inode with the I_LOCK or I_DIRTY flags set finds itself in the inode_in_use list. Without either of these flags, it is added to the inode_unused list. The dentry structure represents a directory entry and the VFS uses it to keep track of relations based on directory naming, organization, and logical layout of files. Each dentry object corresponds to a component in a pathname and associates other structures and information that relates to it. For example, in the path /home/lkp/Chapter06.txt, there is a dentry created for /, home, lkp, and Chapter06.txt. Each dentry has a reference to that component's inode, superblock, and related information. Figure 6.6 illustrates the relationship between the superblock, the inode, and the dentry structs. The d_inode field points to the inode corresponding with the file associated with the dentry. In the case that the pathname component corresponding with the dentry does not have an associated inode, the value is NULL. These are the pointers to the adjacent elements in the dentry lists. A dentry object can find itself in one of the kinds of lists shown in Table 6.5. The inode with which these dentrys are associated points to the head of the list via the i_dentry field. These dentrys are no longer in use but are kept around in case the same components are accessed in a pathname. The d_op field points to the table of dentry operations. This is a pointer to the superblock associated with the component represented by the dentry. Refer to Figure 6.6 to see how a dentry is associated with a superblock struct. This field holds a pointer to the parent dentry, or the dentry corresponding to the parent component in the pathname. For example, in the pathname /home/paul, the d_parent field of the dentry for paul points to the dentry for home, and the d_parent field of this dentry in turn points to the dentry for /. Another structure that the VFS uses is the file structure. When a process manipulates a file, the file structure is the datatype the VFS uses to hold information regarding the process/file association. Unlike other structures, no original on-disk data is held by a file structure; file structures are created on-the-fly upon the issue of the open() syscall and are destroyed upon issue of the close() syscall. Recall from Chapter 3 that throughout the lifetime of a process, the file structures representing files opened by the process are referenced through the process descriptor (the task_struct). Figure 6.7 illustrates how the file structure associates with the other VFS structures. The task_struct points to the file descriptor table, which holds a list of pointers to all the file descriptors that process has opened. Recall that the first three entries in the descriptor table correspond to the file descriptors for stdin, stdout, and stderr, respectively. The kernel keeps file structures in circular doubly linked lists. There are three lists in which a file structure can find itself embedded depending on its usage and assignment. Table 6.6 describes the three lists. A doubly linked list composed of all file objects that are available. The size of this list is always at least NR_RESERVED_FILES large. 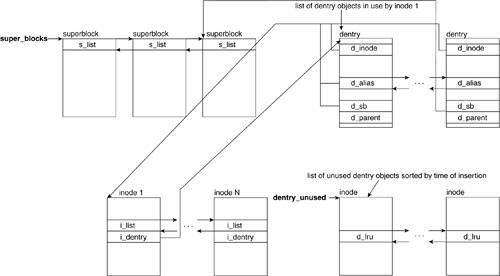 A doubly linked list composed of all file objects that are being used but have not been assigned to a superblock. 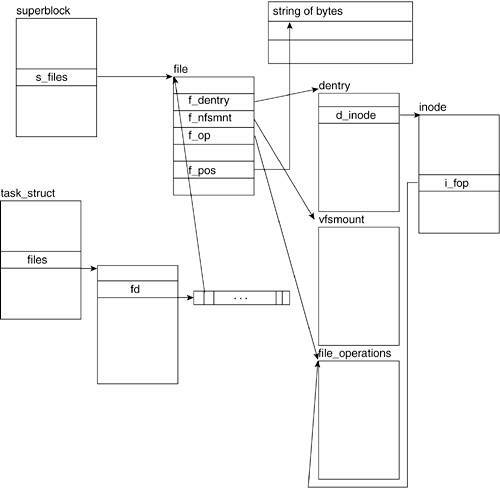 A doubly linked list composed of all file objects that have a file associated with a superblock. The kernel creates the file structure by way of get_empty_filp(). This routine returns a pointer to the file structure or returns NULL if there are no more free structures or if the system has run out of memory. The f_list field of type list_head holds the pointers to the adjacent file structures in the list. This is a pointer to the dentry structure associated with the file. This is a pointer to the vfsmount structure that is associated with the mounted filesystem that the file is in. All filesystems that are mounted have a vfsmount structure that holds the related information. Figure 6.8 illustrates the data structures associated with vfsmount structures. This is a pointer to the file_operations structure, which holds the table of file operations that can be applied to a file. (The inodes field i_fop points to the same structure.) Figure 6.7 illustrates this relationship. Numerous processes can concurrently access a file. The f_count field is set to 0 when the file structure is unused (and, therefore, available for use). The f_count field is set to 1 when it's associated with a file and incremented by one thereafter with each process that handles the file. Thus, if a file object that is in use represents a file accessed by four different processes, the f_count field holds a value of 5. The f_flags field contains the flags that are passed in via the open() syscall. We cover this in more detail in the "open()" section. The f_pos field holds the file offset. This is essentially the read/write pointer that some of the methods in the file operations table use to refer to the current position in the file. We need to know who the owner of the process is to determine file access permissions when the file is manipulated. These fields correspond to the uid and the gid of the user who started the process and opened the file structure. A file can read pages from the page cache, which is the in-memory collection of pages, in advance. The read-ahead optimization involves reading adjacent pages of a file prior to any of them being requested to reduce the number of costly disk accesses. The f_ra field holds a structure of type file_ra_state, which contains all the information related to the file's read-ahead state. This field points to the address_space struct, which corresponds to the page-caching mechanism for this file. This is discussed in detail in the "Page Cache" section. 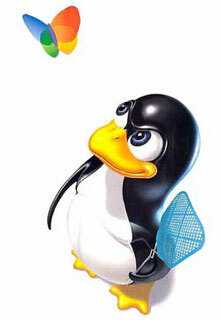 The Linux kernel uses global variables that hold pointers to linked lists of the structures previously mentioned. All structures are kept in a doubly linked list. The kernel keeps a pointer to the head of the list using this as an access point to the list. The structures all have fields of type list_head, which they use to point to the previous and next elements in the list. Table 6.7 summarizes the global variables that the kernel holds and the type of list it keeps a reference to. The inode struct has a variation of this called hlist_node, as we saw in Section 6.2.1.3, "inode Structure." The super_block, file_system_type, dentry, and vfsmount structures are all kept in their own list. Inodes can find themselves in either global inode_in_use or inode_unused, or in the local list of the superblock under which they correspond. Figure 6.9 shows how some of these structures interrelate. The super_blocks variable points to the head of the superblock list with the elements pointing to the previous and next elements in the list by means of the s_list field. The s_dirty field of the superblock structure in turn points to the inodes it owns, which need to be synchronized with the disk. Inodes not in a local superblock list are in the inode_in_use or inode_unused lists. All inodes point to the next and previous elements in the list by way of the i_list field. The superblock also points to the head of the list containing the file structs that have been assigned to that superblock by way of the s_files list. The file structs that have not been assigned are placed in one of the free_list lists of the anon_list list. Both lists have a dummy file struct as the head of the list. All file structs point to the next and previous elements in their list by using the f_list field. Refer to Figure 6.6 to see how the inode points to the list of dentry structures by using the i_dentry field. Other than the four main VFS structures, a few other structures interact with VFS: fs_struct, files_struct, namespace, and fd_set. The structures fs_struct, files_stuct, and namespace are all process-related objects that contain file-related data. Figure 6.10 relates how a process descriptor associates with file-related structures. We now look at these additional structures. In Linux, multiple processes could refer to a single file. As a result, the Linux VFS must store information about how processes and files interact. For example, a process started by one user might differ from a process started by another user with respect to permissions related to file operations. 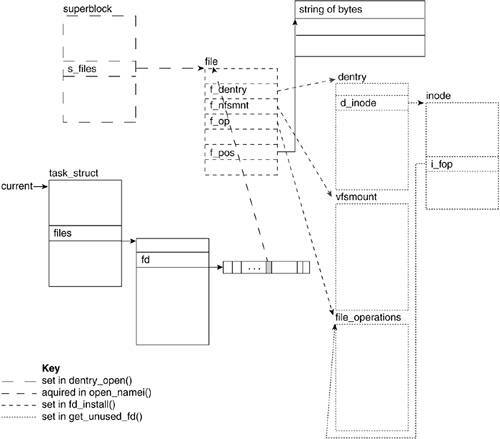 The fs_struct structure holds all the information associating a particular process to a file. We need to examine the fs_struct structure prior to examining the files_struct structure because it uses the fs_struct datatype. The count field holds the number of process descriptors that reference the particular fs_struct. The umask field holds the mask representing the permissions to be set on files opened. The root and pwd fields are pointers to the dentry object associated with the process' root directory and current working directory, respectively. altroot is a pointer to the dentry structure of an alternative root directory. This field is used for emulation environments. The fields rootmnt, pwdmnt, and altrootmnt are pointers to the mounted filesystem object of the process' root, current working, and alternative root directories, respectively. files_struct contains information related to open files and their descriptors. In the introduction, we mentioned that file descriptors are unique int datatypes associated with an open file. In kernel terms, the file descriptor is the index into the fd array of the files object of the current task's task_struct or current->files->fd. Figure 6.7 shows the fd array of a task_struct and how it points to the file's file structure. The count field exists because the files_struct can be referred to by multiple process descriptors, much like the fs_struct. This field is incremented in the kernel routine fget() and decremented in the kernel routine fput(). These functions are called during the file-closing process. The max_fds field keeps track of the maximum number of files that the process can have open. The default of max_fds is 32 as associated with NR_OPEN_DEFAULT size of the fd_array. When a file wants to open more than 32 files, this value is grown. The max_fdset field keeps track of the maximum number of file descriptors. Similar to max_fds, this field can be expanded if the total number of files the process has open exceeds its value. The next_fd field holds the value of the next file descriptor to be assigned. We see how it is manipulated through the opening and closing of files, but one thing should be understood: File descriptors are assigned in an incremental manner unless a previously assigned file descriptor's associated file is closed. In this case, the next_fd field is set to that value. Thus, file descriptors are assigned in a lowest available value manner. The fd array points to the open file object array. It defaults to fd_array, which holds 32 file descriptors. When a request for more than 32 file descriptors comes in, it points to a newly generated array. close_on_exec, open_fds, close_on_exec_init, and open_fds_init are all fields of type fd_set. We mentioned that the fd_set structure holds sets of file descriptors. Before explaining each field individually, we look at the fd_set structure. Four macros are available for the manipulation of these file descriptor sets (see Table 6.8). Sets the file descriptor in the set. Clears the file descriptor from the set. Clears the file descriptor set. Returns if the file descriptor is set. Now, we look at the various fields. The close_on_exec field is a pointer to the set of file descriptors that are marked to be closed on exec(). It initially (and usually) points to the close_on_exec_init field. This changes if the number of file descriptors marked to be open on exec() grows beyond the size of the close_on_exec_init bit field. The open_fds field is a pointer to the set of file descriptors that are marked as open. Like close_on_exec, it initially points to the open_fds_init field and changes if the number of file descriptors marked as open grows beyond the size of open_fds_init bit field. The close_on_exec_init field holds the bit field that keeps track of the file descriptors of files that are to be closed on exec(). The open_fds_init field holds the bit field that keeps track of the file descriptors of files that are open. The fd_array array pointer points to the first 32 open file descriptors. Figure 6.11 illustrates what the fs_struct looks like after it is initialized. The NR_OPEN_DEFAULT global definition is set to BITS_PER_LONG, which is 32 on 32-bit systems and 64 on 64-bit systems. In the introductory sections, we mentioned that the page cache is an in-memory collection of pages. When data is frequently accessed, it is important to be able to quickly access the data. When data is duplicated and synchronized across two devices, one of which typically is smaller in storage size but allows much faster access than the other, we call it a cache. A page cache is how an operating system stores parts of the hard drive in memory for faster access. We now look at how it works and is implemented. When you perform a write to a file on your hard drive, that file is broken into chunks called pages, that are swapped into memory (RAM). The operating system updates the page in memory and, at a later date, the page is written to disk. If a page is copied from the hard drive to RAM (which is called swapping into memory), it can become either clean or dirty. A dirty page has been modified in memory but the modifications have not yet been written to disk. A clean page exists in memory in the same state that it exists on disk. In Linux, the memory is divided into zones. Each zone has a list of active and inactive pages. When a page is inactive for a certain amount of time, it gets swapped out (written back to disk) to free memory. Each page in the zones list has a pointer to an address_space. Each address_space has a pointer to an address_space_operations structure. Pages are marked dirty by calling the set_dirty_page() function of the address_space_operation structure. Figure 6.12 illustrates this dependency. See Chapter 4 for more on memory zones. The core of the page cache is the address_space object. Let's take a close look at it. The inline comments of the structure are fairly descriptive. Some additional explanation might help in understanding how the page cache operates. Usually, an address_space is associated with an inode and the host field points to this inode. However, the generic intent of the page cache and address space structure need not require this field. It could be NULL if the address_space is associated with a kernel object that is not an inode. The address_space structure has a field that should be intuitively familiar to you by now: address_space_operations. Like the file structure file_operations, address_space_operations contains information about what operations are valid for this address_space. These functions are reasonably straightforward. readpage() and writepage() read and write pages associated with an address space, respectively. Multiple pages can be written and read via readpages() and writepages(). Journaling file systems, such as ext3, can provide functions for prepare_write() and commit_write(). When the kernel checks the page cache for a page, it must be blazingly fast. As such, each address space has a radix_tree, which performs a quick search to determine if the page is in the page cache or not. Figure 6.13 illustrates how files, inodes, address spaces, and pages relate to each other; this figure is useful for the upcoming analysis of the page cache code. 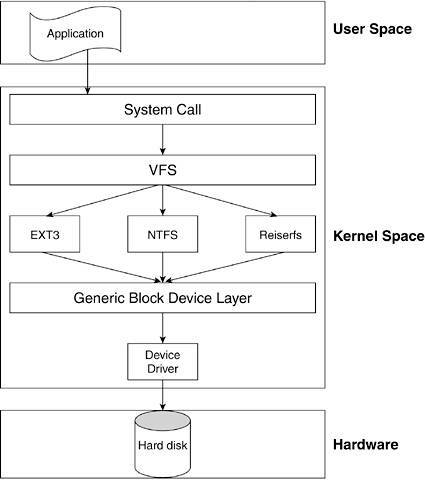 Each sector on a block device is represented by the Linux kernel as a buffer_head structure. A buffer_head contains all the information necessary to map a physical sector to a buffer in physical memory. The buffer_head structure is illustrated in Figure 6.14. The physical sector that a buffer_head structure refers to is logical block b_blocknr on device b_dev. 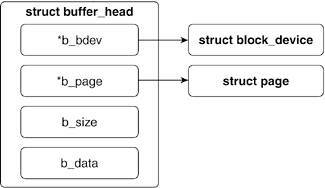 The physical memory that a buffer_head structure refers to is a block of memory starting at b_data of b_size bytes. This memory block is within the physical page of b_page. As mentioned in Chapter 4, each physical memory page in the Linux kernel is represented by a struct page. A page is composed of a number of I/O blocks. As each I/O block can be no larger than a page (although it can be smaller), a page is composed of one or more I/O blocks. In older versions of Linux, block I/O was only done via buffers, but in 2.6, a new way was developed, using bio structures. The new way allows the Linux kernel to group block I/O together in a more manageable way. Suppose we write a portion of the top of a text file and the bottom of a text file. This update would likely need two buffer_head structures for the data transfer: one that points to the top and one that points to the bottom. A bio structure allows file operations to bundle discrete chunks together in a single structure. This alternate way of looking at buffers and pages occurs by looking at the contiguous memory segments of a buffer. The bio_vec structure represents a contiguous memory segment in a buffer. The bio_vec structure is illustrated in Figure 6.15. The bio_vec structure holds a pointer to a page, the length of the segment, and the offset of the segment within the page. A bio structure is composed of an array of bio_vec structures (along with other housekeeping fields). Thus, a bio structure represents a number of contiguous memory segments of one or more buffers on one or more pages. See include/linux/bio.h for detailed information on struct bio. Until this point, we covered all the structures that are associated with the VFS and the page cache. Now, we focus on two of the system calls used in file manipulation and trace their execution down to the kernel level. We see how the open(), close(), read(), and write() system calls make use of the structures previously described. We mentioned that in the VFS, files are treated as complete abstractions. You can open, read, write, or close a file, but the specifics of what physically happens are unimportant to the VFS layer. Chapter 5 covers these specifics. Hooked into the VFS is the filesystem-specific layer that translates the VFS' file I/O to pages and blocks. Because you can have many specific filesystem types on a computer system, like an ext2 formatted hard disk and an iso9660 cdrom, the filesystem layer can be divided into two main sections: the generic filesystem operations and the specific filesystem operations (refer to Figure 6.3). Following our top-down approach, this section traces a read and write request from the VFS call of read(), or write(), tHRough the filesystem layer until a specific block I/O request is handed off to the block device driver. In our travels, we move between the generic filesystem and specific filesystem layer. We use the ext2 filesystem driver as the example of the specific filesystem layer, but keep in mind that different filesystem drivers could be accessed depending on what file is being acted upon. As we progress, we will also encounter the page cache, which is a construct within Linux that is positioned in the generic filesystem layer. In older versions of Linux, a buffer cache and page cache exist, but in the 2.6 kernel, the page cache has consumed any buffer cache functionality. The open syscall takes as its arguments the pathname of the file, the flags to identify access mode of the file being opened, and the permission bit mask (if the file is being created). open() returns the file descriptor of the opened file (if successful) or an error code (if it fails). The flags parameter is formed by bitwise ORing one or more of the constants defined in include/linux/fcntl.h. Table 6.9 lists the flags for open() and the corresponding value of the constant. Only one of O_RDONLY, O_WRONLY, or O_RDWR flags has to be specified. The additional flags are optional. Opens file for reading and writing. Indicates that, if the file does not exist, it should be created. The creat() function is equivalent to the open() function with this flag set. Used in conjunction with O_CREAT, this indicates the open() should fail if the file does exist. In the case that pathname refers to a terminal device, the process should not consider it a controlling terminal. If the file exists, truncate it to 0 bytes. Writes at the end of the file. Opens the file in non-blocking mode. Writes to the file have to wait for the completion of physical I/O. Applied to files on block devices. Minimizes cache buffering on I/O to the file. The large filesystem allows files of sizes greater than can be represented in 31 bits. This ensures they can be opened. If the pathname does not indicate a directory, the open is to fail. If the pathname is a symbolic link, the open is to fail. Verify if our system is non-32-bit. If so, enable the large filesystem support flag O_LARGEFILE. This allows the function to open files with sizes greater than those represented by 31 bits. The getname() routine copies the filename from user space to kernel space by invoking strncpy_from_user(). The get_unused_fd() routine returns the first available file descriptor (or index into fd array: current->files->fd) and marks it busy. The local variable fd is set to this value. The pathname lookup functions, such as open_namei(), expect the access mode flags encoded in a specific format that is different from the format used by the open system call. These lines copy the access mode flags into the namei_flags variable and format the access mode flags for interpretation by open_namei(). The main difference is that, for pathname lookup, it can be the case that the access mode might not require read or write permission. This "no permission" access mode does not make sense when trying to open a file and is thus not included under the open system call flags. "No permission" is indicated by the value of 00. Read permission is then indicated by setting the value of the low-order bit to 1 whereas write permission is indicated by setting the value of the high-order bit to 1. The open system call flags for O_RDONLY, O_WRONLY, and O_RDWR evaluate to 00, 01, and 02, respectively as seen in include/asm/fcntl.h. The namei_flags variable can extract the access mode by logically bit ANDing it with the O_ACCMODE variable. This variable holds the value of 3 and evaluates to true if the variable to be ANDed with it holds a value of 1, 2, or 3. If the open system call flag was set to O_RDONLY, O_WRONLY, and O_RDWR, adding a 1 to this value translates it into the pathname lookup format and evaluates to true when ANDed with O_ACCMODE. The second check just assures that if the open system call flag is set to allow for file truncation, the high-order bit is set in the access mode specifying write access. The open_namei() routine performs the pathname lookup, generates the associated nameidata structure, and derives the corresponding inode. The dentry_open() is a wrapper routine around dentry_open_it(), which creates and initializes the file structure. It creates the file structure via a call to the kernel routine get_empty_filp(). This routine returns ENFILE if the files_stat.nr_files is greater than or equal to files_stat.max_files. This case indicates that the system's limit on the total number of open files has been reached. The file struct is assigned by way of the call to get_empty_filp(). The f_flags field of the file struct is set to the flags passed in to the open system call. The f_mode field is set to the access modes passed to the open system call, but in the format expected by the pathname lookup functions. The files struct's f_dentry field is set to point to the dentry struct that is associated with the file's pathname. The f_vfsmnt field is set to point to the vmfsmount struct for the filesystem. f_pos is set to 0, which indicates that the starting position of the file_offset is at the beginning of the file. The f_op field is set to point to the table of operations pointed to by the file's inode. The file_move() routine is called to insert the file structure into the filesystem's superblock list of file structures representing open files. This is where the next level of the open function occurs. It is called here if the file has more file-specific functionality to perform to open the file. It is also called if the file operations table for the file contains an open routing. This concludes the dentry_open_it() routine. By the end of filp_open(), we will have a file structure allocated, inserted at the head of the superblock's s_files field, with f_dentry pointing to the dentry object, f_vfsmount pointing to the vfsmount object, f_op pointing to the inode's i_fop file operations table, f_flags set to the access flags, and f_mode set to the permission mode passed to the open() call. The fd_install() routine sets the fd array pointer to the address of the file object returned by filp_open(). That is, it sets current->files->fd[fd]. The putname() routine frees the kernel space allocated to store the filename. The file descriptor fd is returned. The put_unused_fd() routine clears the file descriptor that has been allocated. This is called when a file object failed to be created. Figure 6.16 illustrates the structures that are initialized and set and identifies the routines where this was done. Table 6.10 shows some of the sys_open() return errors and the kernel routines that find them. File does not exist (and flag O_CREAT not set). Process has maximum number of files open. System has maximum number of files open. The current task_struct's files field point at the files_struct that corresponds to our file. These lines begin by locking the file so as to not run into synchronization problems. We then check that the file descriptor is valid. If the file descriptor number is greater than the highest allowable file number for that file, we remove the lock and return the error EBADF. Otherwise, we acquire the file structure address. If the file descriptor index does not yield a file structure, we also remove the lock and return the error as there would be nothing to close. Here, we set the current->files->fd[fd] to NULL, removing the pointer to the file object. We also clear the file descriptor's bit in the file descriptor set referred to by files->close_on_exec. Because the file descriptor is closed, the process need not worry about keeping track of it in the case of a call to exec(). The next_fd field holds the value of the next file descriptor to be assigned. If the current file descriptor's value is less than that held by files->next_fd, this field will be set to the value of the current file descriptor instead. This assures that file descriptors are assigned on the basis of the lowest available value. These lines clear any outstanding errors. This is a sanity check on the conditions necessary to close a file. A file with a file_count of 0 should already be closed. Hence, in this case, filp_close returns an error. Invokes the file operation flush() (if it is defined). What this does is determined by the particular filesystem. fput() is called to release the file structure. The actions performed by this routine include calling file operation release(), removing the pointer to the dentry and vfsmount objects, and finally, releasing the file object. Table 6.11 shows some of the sys_close() return errors and the kernel routines that find them. sys_read() takes a file descriptor, a user-space buffer pointer, and a number of bytes to read from the file into the buffer. A file lookup is done to translate the file descriptor to a file pointer with fget_light(). 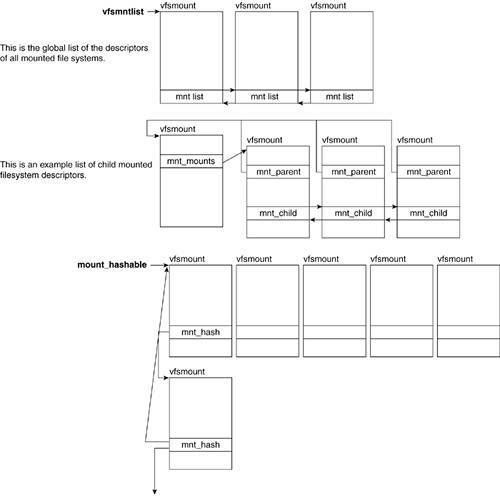 We then call vfs_read(), which does all the main work. Each fget_light() needs to be paired with fput_light(,) so we do that after our vfs_read() finishes. The first three parameters are all passed via, or are translations from, the original sys_read() parameters. The fourth parameter is the offset within file, where the read should start. This could be non-zero if vfs_read() is called explicitly because it could be called from within the kernel. We store a pointer to the file's inode. Basic checking is done on the file operations structure to ensure that read or asynchronous read operations have been defined. If no read operation is defined, or if the operations table is missing, the function returns the EINVAL error at this point. This error indicates that the file descriptor is attached to a structure that cannot be used for reading. We verify that the area to be read is not locked and that the file is authorized to be read. If it is not, we notify the parent of the file (on lines 218219). These are the guts of vfs_read(). If the read file operation has been defined, we call it; otherwise, we call do_sync_read(). In our tracing, we follow the standard file operation read and not the do_sync_read() function. Later, it becomes clear that both calls eventually reach the same underlying point. This is our first encounter with one of the many abstractions where we move between the generic filesystem layer and the specific filesystem layer. 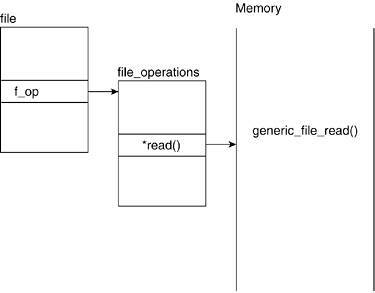 Figure 6.17 illustrates how the file structure points to the specific filesystem table or operations. Recall that when read_inode() is called, the inode information is filled in, including having the fop field point to the appropriate table of operations defined by the specific filesystem implementation (for example, ext2). You can see that for nearly every file operation, the ext2 filesystem has decided that the Linux defaults are acceptable. This leads us to ask when a filesystem would want to implement its own file operations. When a filesystem is sufficiently unlike a UNIX filesystem, extra steps might be necessary to allow Linux to interface with it. For example, MSDOS- or FAT-based filesystems need to implement their own write but can use the generic read. See fs/fat/file.c for more information. Notice that the same parameters are simply being passed along from the upper-level reads. We have filp, the file pointer; buf, the pointer to the memory buffer where the file will be read into; count, the number of characters to read; and ppos, the position within the file to begin reading from. An iovec structure is created that contains the address and length of the user space buffer that the results of the read are to be stored in. The bulk of the read is done in the generic asynchronous file read function. kiocb and iovec are two datatypes that facilitate asynchronous I/O operations within the Linux kernel. Asynchronous I/O is desirable when a process wishes to perform an input or output operation without immediately waiting for the result of the operation. It is extremely desirable for high I/O environments, as you can allow the device the opportunity to order and schedule the I/O requests instead of the process. This is simply a pointer to a section of memory and the length of the memory. The kernel I/O control block (kiocb) is a structure that is required to help manage how and when the I/O vector gets operated upon asynchronously. __generic_file_aio_read() function uses the kiocb and iovec structures to read the page_cache directly. After we send off the read, we wait until the read finishes and then return the result of the read operation. Recall that nr_segs was set to 1 by our caller and that iocb and iov contain the file pointer and buffer information. We immediately extract the file pointer from iocb. This for loop verifies that the iovec struct passed is composed of valid segments. Recall that it contains the user space buffer information. This section of code is only entered if the read is direct I/O. Direct I/O bypasses the page cache and is a useful property of certain block devices. For our purposes, however, we do not enter this section of code at all. Most file I/O takes our path as the page cache, which we describe soon, which is much faster than the underlying block device. Because our iovec is valid and we have only one segment, we execute this for loop once only. The field written keeps a running count of the number of bytes transferred. The field count keeps a running count of the number of bytes left to be transferred. The field buf holds the current position into the buffer. The field error holds any error code encountered during the read operation. We pass our new read_descriptor_t structure desc to do_generic_file_read(), along with our file pointer filp and our position ppos. file_read_actor() is a function that copies a page to the user space buffer located in desc. file_read_actor() can be found on line 794 of mm/filemap.c. The amount read is calculated and returned to the caller. At this point in the read() internals, we are about to access the page cache and determine if the sections of the file we want to read already exist in RAM, so we don't have to directly access the block device. The page cache is described in Section 6.4, "Page Cache." Recall that the last function we encountered passed a file pointer filp, an offset ppos, a read_descriptor_t desc, and a function file_read_actor into do_generic_file_read(). do_generic_file_read() is simply a wrapper to do_generic_mapping_read(). filp->f_mapping is a pointer to an address_space object and filp->f_ra is a structure that holds the address of the file's read-ahead state. See the "file Structure" section for more information about this field and read-ahead optimization. So, we've transformed our read of a file into a read of the page cache via the address_space object in our file pointer. Because do_generic_mapping_read() is an extremely long function with a number of separate cases, we try to make the analysis of the code as painless as possible. We extract the inode of the file we're reading from address_space. We initialize cached_page to NULL until we can determine if it exists within the page cache. We also calculate index and offset based on page cache constraints. The index corresponds to the page number within the page cache, and the offset corresponds to the displacement within that page. When the page size is 4,096 bytes, a right bit shift of 12 on the file pointer yields the index of the page. This section of code iterates through the page cache and retrieves enough pages to fulfill the bytes requested by the read command. We attempt to find the first page required. If the page is not in the page cache, we jump to the no_cached_page label. If the page is not up to date, we jump to the page_not_up_to_date label. find_get_page() uses the address space's radix tree to find the page at index, which is the specified offset. 693     * before reading the page on the kernel side. 699     * Mark the page accessed if we read the beginning. The inline comments are descriptive so there's no point repeating them. Notice that on lines 656658, if more pages are to be retrieved, we immediately return to the top of the loop where the index and offset manipulations in lines 714716 help choose the next page to retrieve. If no more pages are to be read, we break out of the for loop. If the page is not up to date, we check it again and return to the page_ok label if it is, now, up to date. Otherwise, we try to get exclusive access; this causes us to sleep until we get it. Once we have exclusive access, we see if the page attempts to remove itself from the page cache; if it is, we hasten it along before returning to the top of the for loop. If it is still present and is now up to date, we unlock the page and jump to the page_ok label. If we read a page successfully, we check that it's up to date and jump to page_ok when it is. If a synchronous read error occurred, we log the error in desc, release the page from the page cache, and break out of the for loop. If the page to be read wasn't cached, we allocate a new page in the address space and add it to both the least recently used (LRU) cache and the page cache. If we have an error adding the page to the cache because it already exists, we jump to the find_page label and try again. This could occur if multiple processes attempt to read the same uncached page; one would attempt allocation and succeed, the other would attempt allocation and find it already existing. If there is an error in adding the page to the cache other than it already existing, we log the error and break out of the for loop. When we successfully allocate and add the page to the page cache and LRU cache, we set our page pointer to the new page and attempt to read it by jumping to the readpage label. We calculate the actual offset based on our page cache index and offset. If we allocated a new page and could add it correctly to the page cache, we remove it. We update the file's last accessed time via the inode. The logic described in this function is the core of the page cache. Notice how the page cache does not touch any specific filesystem data. This allows the Linux kernel to have a page cache that can cache pages regardless of the underlying filesystem structure. Thus, the page cache can hold pages from MINIX, ext2, and MSDOS all at the same time. ext2_readpage() calls mpage_readpage(),which is a generic filesystem layer call, but passes it the specific filesystem layer function ext2_get_block(). We allocate space for managing the bio structure the address space uses to manage the page we are trying to read from the device. do_mpage_readpage() is called, which translates the logical page to a bio structure composed of actual pages and blocks. The bio structure keeps track of information associated with block I/O. We send the newly created bio structure to mpage_bio_submit() and return. Using the file descriptor from a call to read(), we locate the file pointer from which we obtain an inode. The filesystem layer checks the in-memory page cache for a page, or pages, that correspond to the given inode. If no page is found, the filesystem layer uses the specific filesystem driver to translate the requested sections of the file to I/O blocks on a given device. 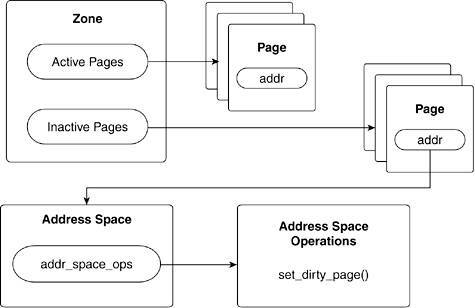 We allocate space for pages in the page cache address_space and create a bio structure that ties the new pages with the sectors on the block device. The first thing to notice is that mpage_bio_submit() works for both read and write calls via the rw parameter. It submits a bio structure that, in the read case, is empty and needs to be filled in. In the write case, the bio structure is filled and the block device driver copies the contents to its device. If we are reading or writing, we set the appropriate function that will be called when I/O ends. We call submit_bio() and return NULL. Recall that mpage_readpage() doesn't do anything with the return value of mpage_bio_submit(). 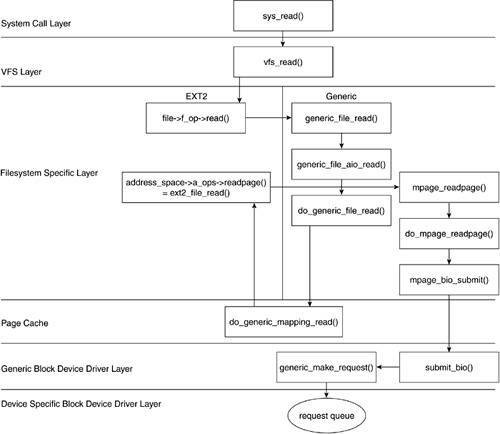 submit_bio() is part of the generic block device driver layer of the Linux kernel. These calls enable some debugging: Set the read/write attribute of the bio structure, and perform some page state housekeeping. These lines handle the rare case that a block dump occurs. A debug message is thrown. generic_make_request() contains the main functionality and uses the specific block device driver's request queue to handle the block I/O operation. 2340 * completion notification should be signaled. In these stages, we constructed the bio structure, and thus, the bio_vec structures are mapped to the memory buffer mentioned on line 2337, and the bio struct is initialized with the device address parameters as well. If you want to follow the read even further into the block device driver, refer to the "Block Device Overview"section in Chapter 5, which describes how the block device driver handles request queues and the specific hardware constraints of its device. Figure 6.18 illustrates how the read() system call traverses through the layers of kernel functionality. After the block device driver reads the actual data and places it in the bio structure, the code we have traced unwinds. The newly allocated pages in the page cache are filled, and their references are passed back to the VFS layer and copied to the section of user space specified so long ago by the original read() call. However, we hear you ask, "Isn't this only half of the story? What if we wanted to write instead of read?" We hope that these descriptions made it somewhat clear that the path a read() call takes through the Linux kernel is similar to the path a write() call takes. However, we now outline some differences. Instead of calling generic_file_read(), we call generic_file_write(). generic_file_write() obtains a lock on the file to prevent two writers from simultaneously writing to the same file, and calls generic_file_write_nolock(). generic_file_write_nolock() converts the file pointers and buffers to the kiocb and iovec parameters and calls the page cache write function generic_file_aio_write_nolock(). Here is where a write diverges from a read. If the page to be written isn't in the page cache, the write does not fall through to the device itself. Instead, it reads the page into the page cache and then performs the write. Pages in the page cache are not immediately written to disk; instead, they are marked as "dirty" and, periodically, all dirty pages are written to disk. There are analogous functions to the read() functions' readpage(). Within generic_file_aio_write_nolock(), the address_space_operations pointer accesses prepare_write() and commit_write(), which are both specific to the filesystem type the file resides upon. Recall ext2_aops, and we see that the ext2 driver uses its own function, ext2_prepare_write(), and a generic function generic_commit_write(). ext2_prepare_write is simply a wrapper for the generic filesystem function block_prepare_write(), which passes in the ext2 filesystem-specific get_block() function. block_prepare_write() allocates any new buffers that are required for the write. For example, if data is being appended to a file enough buffers are created, and linked with pages, to store the new data. generic_commit_write() takes the given page and iterates over the buffers within it, marking each dirty. The prepare and the commit sections of a write are separated to prevent a partial write being flushed from the page cache to the block device. The system's free memory falls below a threshold. Pages from the page cache are flushed to free up memory. Dirty pages reach a certain age. Pages that haven't been written to disk after a certain amount of time are written to their block device. The pdflush daemon calls the filesystem-specific function writepages() when it is ready to write pages to disk. So, for our example, recall the ext2_file_operation structure, which equates writepages() with ext2_writepages(). The pdflush daemon is fairly involved, and for our purposes of tracing a write, we can ignore the complexity. However, if you are interested in the details, mm/pdflush.c, mm/fs-writeback.c, and mm/page-writeback.c contain the relevant code. Like other specific implementations of generic filesystem functions, ext2_ writepages() simply calls the generic filesystem function mpage_writepages() with the filesystem-specific ext2_get_block() function. mpage_writepages() loops over the dirty pages and calls mpage_writepage() on each dirty page. Similar to mpage_readpage(), mpage_writepage() returns a bio structure that maps the physical device layout of the page to its physical memory layout. mpage_writepages() then calls submit_bio() to send the new bio structure to the block device driver to transfer the data to the device itself. Simmmmmmmply superb article.........kudos to u man!!!!!!!!!!!!! By far very best and definite guide on Linux VFS and its structure.